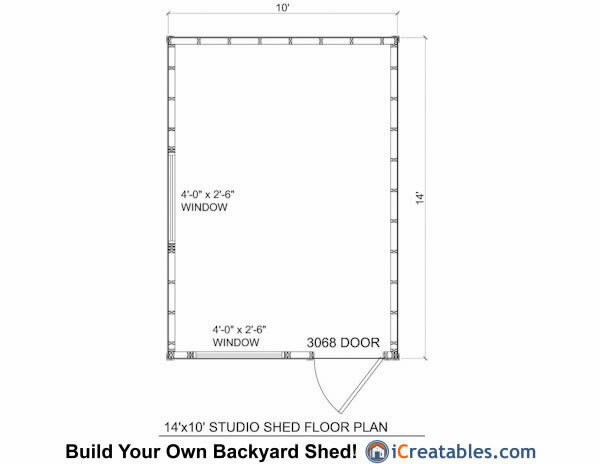 An 14x10 shed designed to be used as a office or workspace. 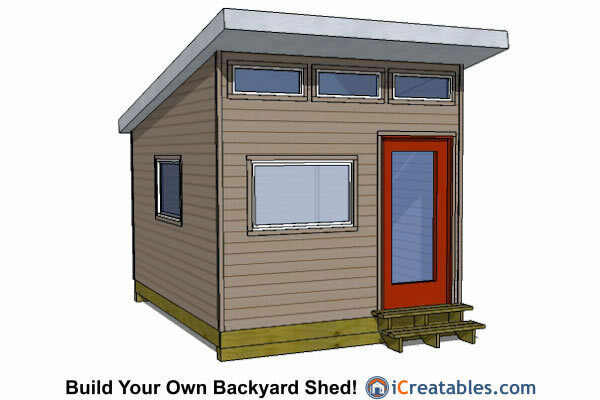 The difference between modern and other storage sheds is mostly the design of the roof and the addition of windows to add light. The usable storage space inside is the same it is simply the look that is different. 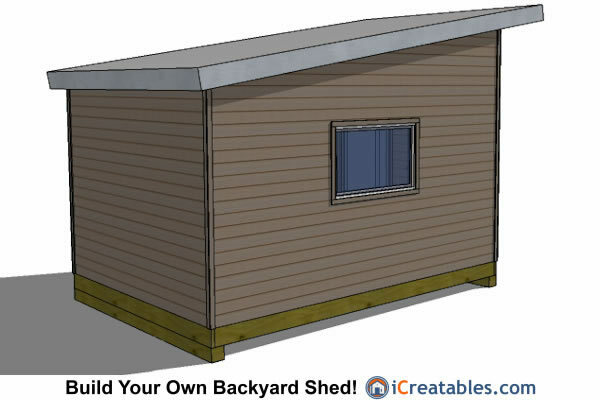 The flat roof is a little simpler to build and there are additional windows. 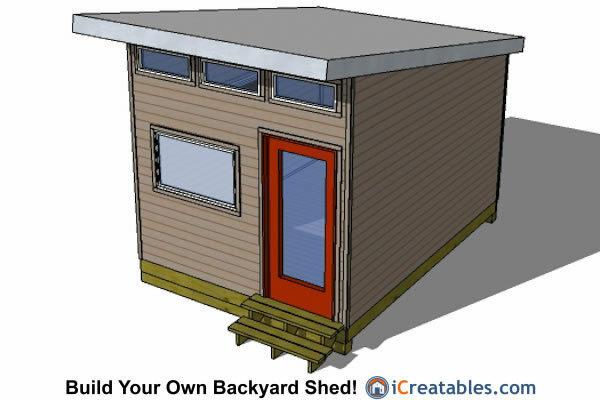 The modern shed also is designed to use a regular residential home door. 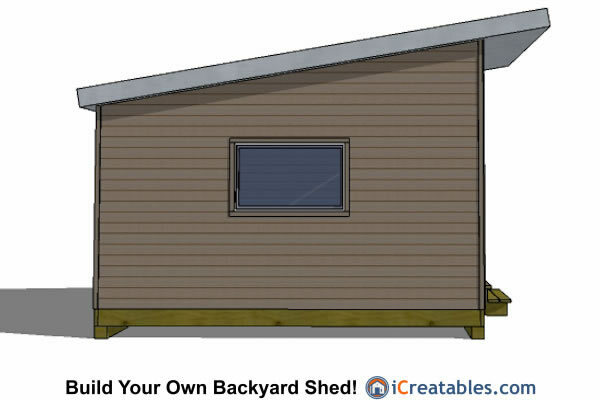 The modern shed can be built without windows. Foundation: 5 different foundations are included in the plans; Wood skid, Concrete slab, Concrete Block Pier, Precast pier and Poured concrete pier. Floor: 2x8 floor joists with 3/4" floor sheathing. Walls: 2x4 framing at 16" on center with a double top plate. The upper shed wall height is 9'-9 3/4"" and the lower shed wall height is 7'-7". The walls are sheeted with 7/16" O.S.B. 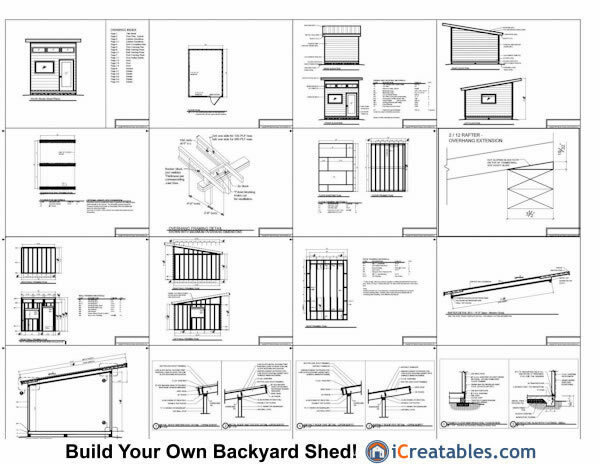 which will hold any siding you wish to put on your modern shed. Door: The specified door is a 3068 full glass residential home pre-hung door. Other doors may be used. Windows: The 2 lower windows are 4026 size (4'-0" x 2'-6") and can open either by awning or casement movement. The upper windows are fixed. The windows may be removed to accomodate your specific needs. Windows are vinyl windows that can be purchased from any window supplier. Siding: 1x8 Tongue and groove siding is specified on the plans. Most sidings that can be attached to O.S.B. sheeting like Vinyl siding, cement board sidings, lap sidings, metal panel or metal corrugated and stucco, can be used. Roof: The roof is framed using 2x10 I joists at 24" on center. 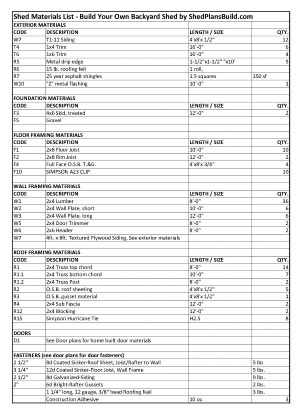 It is sheeted with 7/16" O.S.B. Roofing: Corrugated metal over self adhering Ice and Water Shield. Other roofing materials made for low slope roofs may be used. Trim: 1x3 wood, masonite or cement trim materials are used to finish the corners, roof eves and facia.